The lazy river and pool deck are shaded by a trellis, but open to the sunshine. The beach is just 30 yards from the resort. Large living rooms give everyone space to relax. Admire the ocean from the beachfront pool deck. There are not one but two lazy rivers to choose from. A relaxing swim in the indoor pool is the perfect way to avoid the cold. Grab a refreshing drink at the poolside bar. 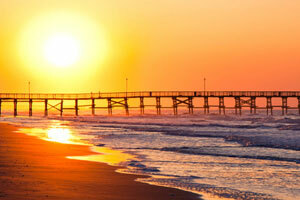 Wyndham Ocean Boulevard is conveniently located in the heart of North Myrtle Beach. The resort has 24-hour security for your family’s peace of mind. After you drop your luggage off at your condo, have everyone change into their swimsuits. Grab dive sticks and water wings, apply sunscreen and get ready for some underwater fun at the three outdoor pools and two indoor pools. Cruise on the lazy river that looks out over the ocean and let the water cool you down in the Carolina sunshine. Grab a cocktail or refreshing iced tea at the poolside bar while the little ones play in the children’s pool. The resort’s activities program for adults and kids includes movie nights, games, crafts and making s’mores. Being on vacation doesn’t mean you have to miss out on your daily cardio. Let the kids hang out in the game room while you get in a workout at the fitness center. One- to three-bedroom condos sleep four to eight guests. Full kitchens have everything you need to channel your inner-Julia Child. The resort is just a short drive from both Food Lion Grocery Store and Walmart where you can pick up the ingredients for Julia’s famous Chocolate Mousse. Let your junior bakers assist and be the official taste testers. Things might get messy, but don’t worry, there’s an in-suite washer/dryer which will definitely come in handy. Enjoy the Chocolate Mousse while you watch a sitcom rerun or the big game on the Flatscreen TV with Cable. Wyndham Ocean Boulevard is only ten minutes from Barefoot Landing which offers some of the best shopping in Myrtle Beach. Barefoot General Store is the place to go for Myrtle Beach themed souvenirs as well as specialty food products and candy. Cariloha features apparel for women and men that is made out of bamboo. For apparel and accessories that change colors when exposed to sunlight, check out Del Sol. Hungry? House of Blues, Joe’s Crab Shack and Wild Wing Cafe are just a few of your dining options. Surprise the little ones with a visit to the Children’s Museum of South Carolina. It features many interactive exhibits that allow children to play while learning at the same time, but don’t tell them that! They can be a bank teller or customer at The Big Bank, a contractor at Under Construction House or a paleontologist at South Carolina Fossil House. Go for a ride on the SkyWheel. It’s almost two-hundred-feet tall and provides a spectacular view of Myrtle Beach. - Tower 4 across the street from the ocean (this includes the Cottages) is open Friday, Saturday, and Sunday from 7:30 AM-6:00 PM. Please contact the property for further details. Contact information is provided in the confirmation email received after booking. The full amount of the deposit will be refunded back upon departure.